Having darn little info on this aircraft, I'll quote out of the Observersbook of aircraft: 1958. "One of the first mixed power interceptorfighters, the Trident II was flown for the first time on July 17, 1955. Apreproduction order for ten machines was placed with the French Air Ministry inJanuary 1956, but this has been reduced to six aircraft. There are now likely tobe of the Trident III type which has modified and strengthened undercarriage andafterburning Gabizos delivering a combined thrust of 6, 660 lbs." 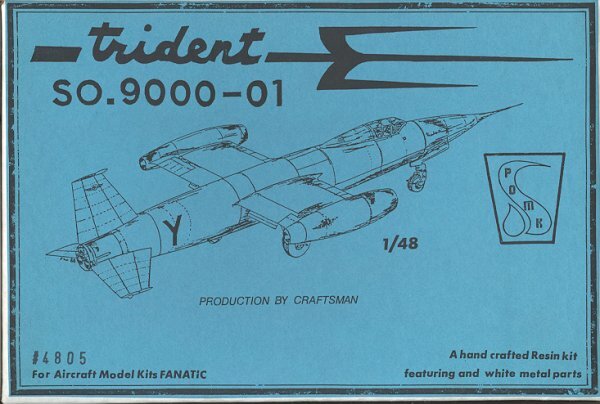 This infoand the following specs are for the SO.9050 Trident II, but the prototype kittedshould be similar. Max speed 1,320 mph at 40,000-70,000 feet. Initial rate of climb20,000 feet per minute. Time to 50,000 feet; 2.5 minutes. Armament: one Matraguided missile. Power plants 1 6,615 lbs of thrust SEPR-631 liquid fuel rocketmotor and two GAMD Viper or Turbomeca Gabizo turbojets. As you can see from the specs, the Trident was developed to be apoint defense fighter. Similar to the Me-163 in approach in that the main motiveforce is a liquid fuelled rocket. However the wing-tip mounted small turbojetswould provide take off and cruise power. They would also allow for anormal landing after the rocket has expended all of its fuel. Needless to say,the program was eventually terminated as it was seen that while the aircraftwould have been effective, it just wasn't the best way to do this kind ofmission. This was especially true once the Mirage III had flown as the Miragewas a normal jet fighter that had the ability to add on a small SEPR rocketmotor to help it get to altitude quickly. This is one of Pend Orielle's firstkits and as an early work is not that bad. Every thing is solid so rather heavy.Detailing is fair and the resin itself is free from air bubble and any glitches,though there are a few rough spots that will need cleaned up. There is no way toeasily install the nose weight that would be required on such a tail-heavymodel. The parts themselves are a bit heavily detailed with some trenches thatwould make Matchbox proud. The wing tip engines are solid and two piece. Thelanding gear are molded out of metal which is very well thought out as a kit ofthis weight will need sturdy gear. The wheel wells and cockpit area are hollowedout to allow you to properly install the pieces. The cockpit doesn't really havemuch more than a seat and headrest so the other bits will have to come from yourspares box. A single vac canopy is included in the kit. Actually,building the kit should not really be a problem at all due to the simpleconstruction and rather straight-forward assembly sequence. 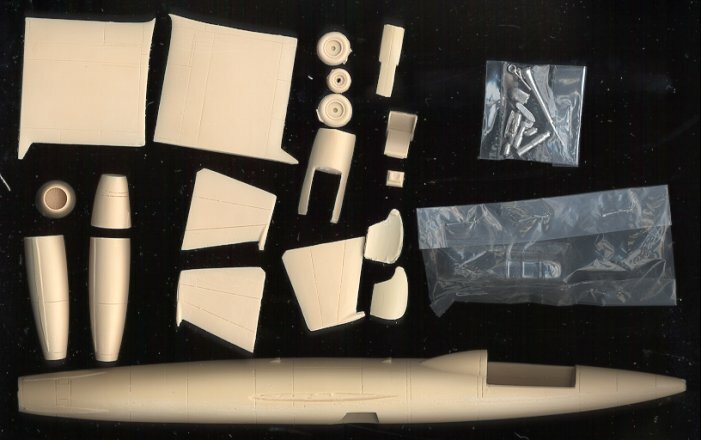 As you can see fromthe image to the right, not much to the kit and lots of room for any additionaldetailing that you might want to do to it. A problem forsome might be that the kit has no decals. The box art shows just a letter Y onthe rear fuselage. The image in the Observers book for the Trident II shows atri-colored rudder and national insignia in addition to the rear fuselage letter.To find out what the prototype (which this kit is) carried in the way ofmarkings, some research is going to be needed. If you would like your product reviewed fairly and quickly by asite that has over 2,800 visits a day, please contactme or see other details in the Note toContributors.